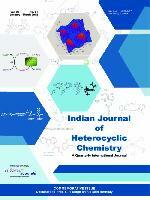 Indian Journal of Heterocyclic Chemistry - a Quarterly International Journal; publishes original research work on heterocyclic chemistry pertaining to structure and synthesis, mechanism of reactions, spectral studies, biologically active compounds, biochemical studies, physicochemical work, phytochemistry etc. Journal Citation Index is 0.685 (originating in Journal Citation Reports, 2016 release - A Thomson Reuters Product). NAAS-India has accredited a rating of 6.79. Only electronic submissions using Microsoft Word should be submitted as email attachments, with figures in power point as separate files. All papers should be in English. Papers should be typed in TIMES NEW ROMAN FONT, double-spaced with 1-inch wide margins on all sides with full title, single column, abstract, graphical abstract, abbreviated title for running headlines (up to 35 characters), keywords, references and figures. The title page should include, in addition to the title, the surnames and initials of each author followed by his or her department, institution and address including postal code and country and email address. Please indicate the author for correspondence, whose telephone, fax and E-mail numbers should be included. The title page should also indicate the number of manuscript pages, figures and tables, drawings, etc. However, files for graphical abstract, figures, tables, photographs, etc should be attached separately. Chemical drawings must be drawn in ChemDraw; and CDX files should be sent separately. All references should be checked very carefully from original source or Chemical Abstracts as the case may be. All references should be numbered and collected at the end of manuscript. Abbreviations of journals should be in accordance with Chemical Abstracts. Only few important recent references should be provided. The papers are required to be PLAGARISM checked as per International requirements. All papers submitted for publication are reviewed by experts and comments of the reviewers are then communicated to the authors. Minor revisions may be handled by the Editorial Office. It is a good idea to get your paper refereed by one of your colleagues before submitting to the Journal. · Authors: First name, middle name (abbreviated), last name. e.g Shiv P. Singh. An [*] asterisk should be placed as superscript after the name of the corresponding author. Mailing Address, Contact numbers and e-Mail ID should be separately mentioned. · All headers in [CAPS Bold 11pt Times New Roman]. Subsequent text in [Normal 10pt Times New Roman]. · ABSTRACT - Not to exceed more than 250 words, should summarize the significant findings and should not contain any references. Ueda, S.; Su, M.; Buchwald, S. L. Highly N2-selective palladium-catalyzed arylation of 1,2,3-triazoles, Angew. Chem. Int. Ed., 2011, 50, 8944-8947. Yan, W.; Wang, Q.; Lin, Q.; Li, M.; Petersen, J. L.; Shi, X. N-2-aryl-1,2,3-triazoles: A novel classs of UV/blue-light-emitting fluorophores with tunable optical properties, Chem. Eur. J., 2011, 17, 5011-5018. · Schemes, Tables and number of compounds (1,2,3--) (wherever mentioned in the paper) should be in bold letters. Figures: All figures should be numbered with consecutive Arabic numbers, have descriptive legends, and be mentioned in the text. Keep figures separate from the text, but indicate an approximate position for each figure in the margin. The quality of line drawings and photographs must be of high enough standard for direct reproduction. Photographs intended for halftone reproductions must be good glossy original prints of maximum contrast. A list of figure legends with relevant figure numbers be typed on a separate sheet and included with the typescript. Tables: Tables should be consecutively numbered with Arabic numbers and have a clear descriptive title at the top. Explanatory table footnotes (designated by superscript lower case letters) typed below the table are acceptable. Abbreviations: Use of abbreviations should be as per the Systeme Internationale symbols. Proofs: The corresponding author will receive proofs (including copies of figures) by email attachment for correction, and these must be returned within 48 hours of receipt. The corrections must be marked only on the PDF file sent - using ‘Comments & Markups’ in the software. Otherwise, mark corrections on the print copy and then send it back through Speed Post / Courier. Please ensure that a full postal address, telephone number and E-mail, if available, are given on the first page of the manuscript, so that proofs are not delayed in the post. Copyright: Submission of a paper will be taken to imply that it represents original work not previously published; which is not being considered elsewhere for publication; and that if accepted for publication, it will not be published elsewhere in the same form in any language, without the consent of the publisher. It is a condition of acceptance by the editor-in-chief of a typescript for publication that the publishers automatically acquire the copyright of the manuscript. Submission of Manuscript: A carefully prepared manuscript in accordance with the style of the Journal is likely to be accepted speedily. Before submitting an article for publication, authors should consult recent issues of the Journal for style and format of presentation. A sample article is available at www.connectjournals.com/ijhc. Manuscripts in electronic form should be submitted by the corresponding author at contact@connectjournals.com.